Hi Guys, all we know very well about the Gmail or Google Mail account. With the help of Gmail or Google Mail you not only send or receive the emails but also use different free Google products. These Google products provide different great features like Drive, Docs, Calendar, Maps, Earth and many more. Gmail provide the facility to store different kind of mail on the internet. You can easily access your email account either from PC, Laptop or Mobile as per your need, if they has internet access. Most of the person have different Gmail accounts and at onetime you will be able to check single email account. Today we have to discuss how to merge more than one Gmail inboxes for Android. Many person have more than one personal or official Gmail accounts. But at the same time they will be able to check or view only single email account on his PC or Android. But after reading this article you will be able to easily merge more than one Gmail inboxes for Android. After that you don’t have to face problem to repeatedly switch the Gmail account. This guide helpful for all those person who want to check more than one personal and official emails on his Gmail accounts at the same-time. Step 1: Most of the person already turn on his registered Gmail account on Android phone. Now, tap on the Gmail option in your Android phone. Step 2: Tap on the three lines which is placed on the top left corner, near the Primary option. Step 3: This will open another window in which you have different options. Tap on the drop down arrow and tap on the “Add account” option. Step 4: Tap on the Google in Set up email option and then tap on the Next button. Enter your new email id to add another Gmail account. After entering your complete Gmail ID, tap on the Next button. Step 5: Type password of your Gmail account and tap on the Next button. Finally tap on the Accept button. Now, your both Gmail accounts are merged and you will be able to view both Gmail accounts emails on your Android. You can easily switch between your more than one Gmail accounts from drop down arrow or swapping left and right of your account picture as per your need. I hope this article is liked by all those person who want to merge more than one Gmail accounts. 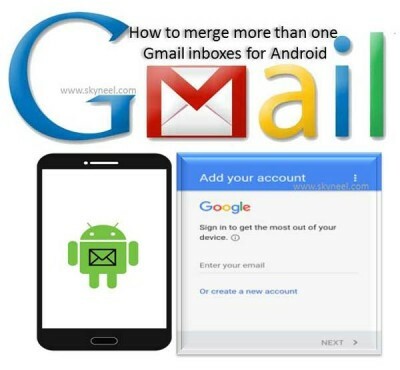 Now after reading this article you will be able to merge more than one Gmail inboxes for Android. Kindly share your knowledge with your friends, family members and others and give important suggestions in the comment box. Thanks to all.